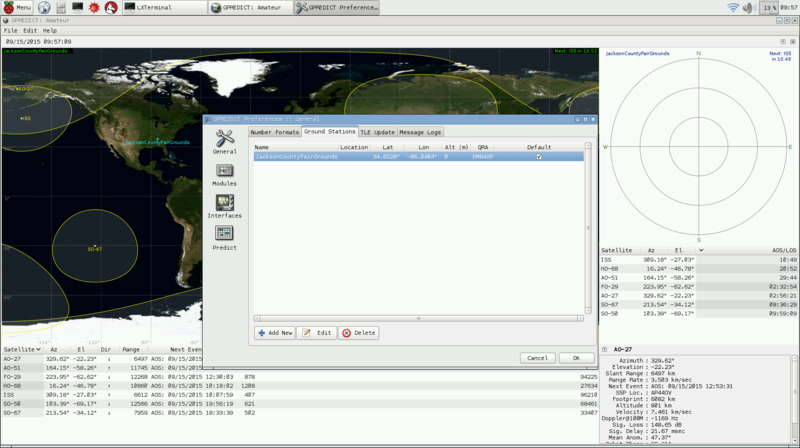 Let’s look at a program used to track the hundreds of satellites in Low Earth Orbit, Gpredict. While this software can be used to track any satellite we’ll focus primarily on satellites with transceivers or beacons in the Amateur Radio bands. Gnome Predict, or Gpredict, allows you to tracks satellites in groups so you don’t have the clutter of having all satellites displayed at once on the screen. 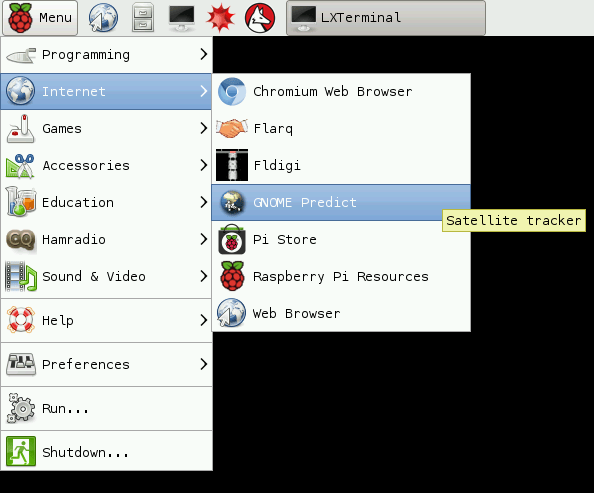 Once installed you’ll find Gpredict in your Pi Menu. When you open Gpredict for the first time you’ll need to add your location to the Ground Stations within Settings. In the screenshot below you can see that this one was setup for use at my local County Fair. Enter your location details and set it as the default location. If you need to locate your exact coordinates you can find your location using Google Maps then right click and select What’s Here?. The exact coordinates will appear at the bottom of the page. The next step is to configure your view. I prefer the wide layout with all views enabled however if you don’t need all of the information or are using a smaller monitor you can set this to the best choice for your needs. You will need to restart the program for the changes to take effect. Lastly we’ll look at the best part of this program, Modules. Gpredict’s Modules allows you to essentially build groups of satellites so you don’t have to track a ton of satellites all the time. By default there is one default Module called Amateur. This Module contains satellites with voice systems only and does not include beacon only and other experimental satellites. 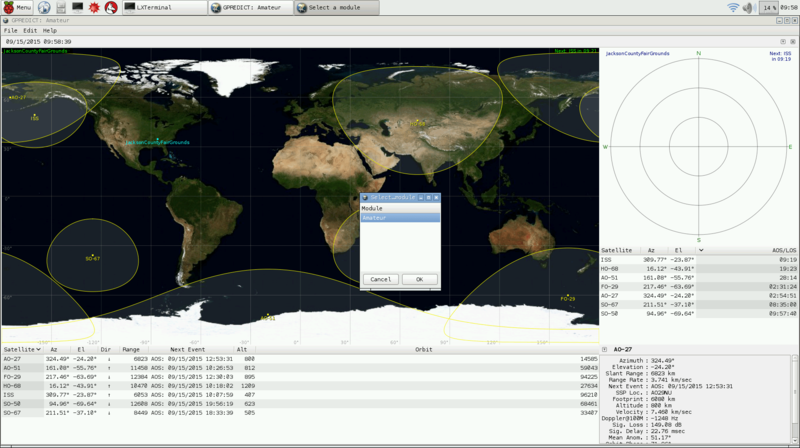 Using the Module editor you can create Modules containing any satellite you want to track. For example I have created modules for beacon satellites and weather satellites along with the voice operational satellites. Gpredict has the latest information since it receives it’s TLE data from the proper sources meaning you will always be up to date on satellite information and trajectory. While there are other satellite tracking software packages available Gpredict has been the easiest to use and most reliable I have found. It runs very lite on the RaspberryPi leaving CPU and RAM available for other programs in the background when needed.